We had flown in to Amritsar for the day from Delhi and planned to fly out the same night. When we arrived the sun was shining and air smelled fresh – much cleaner than Delhi. We met our driver for the day who was to take us to The Golden Temple, the Sikh museum and then out to the Wagah border ceremony. As we drove along, I noticed how much cleaner Amritsar was – less garbage and less homeless people. The roads were evenly paved and there were areas of manicured lawns and hedges that had been trimmed. It gave me a sense that this city was cared for, more affluent, and perhaps more forward thinking than Ahmedabad or Varanasi. Could this be a religious difference I thought? All the other locations I had visited were primarily Hindu, could it be that the Sikhs carried a different sense of their environment, sanitation, and pride? 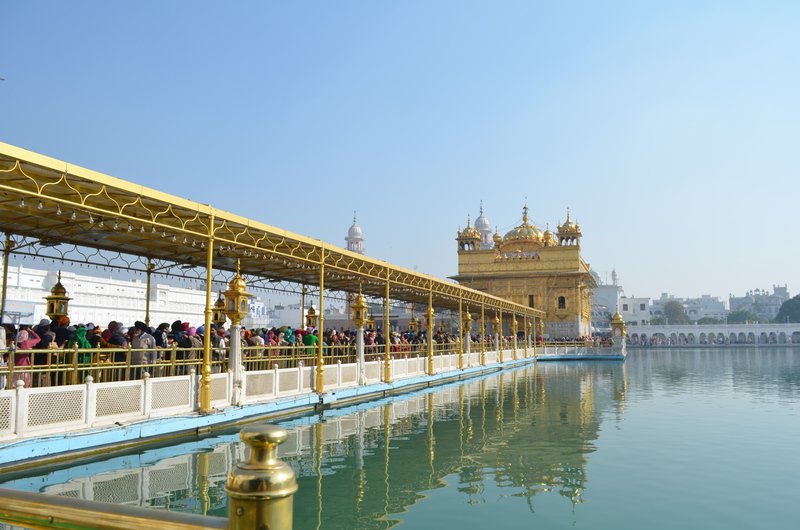 Built in the 16th century by Guru Arjan Dev, the man also responsible for establishing the Sikh religion, it stands in the middle of a man made lake filled with holy water and is completely surrounded by white structures on all sides. There are four entrances representing the openness of the Sikh religion for all people to come and worship. Many photographs and paintings depict historical events and a few trees that also carry significant reference. There is an ashram of sorts there that allow people to sleep there overnight. The temple never closes. We arrived at the entrance area to the Golden Temple to find that we had to remove our shoes (no surprise there) AND our socks! Anything that has touched shoes had to be removed and you were not allowed to even bring them with you in a backpack – you HAD to check them. After we did this, we were lead down a red carpet that was laid out over the rocky walkway. I could feel the stones pressing through the thin rug against my delicate western feet and it was uncomfortable, making me lose my balance as I lifted my feet quickly from the sharp stones. Indians seemed to be walking with ease, relaxed, and some people were pushing past me; I decided to just take my time. Once we arrived at the marble stone entrance, we walked through a foot bathing area that was guarded by a Sikh man wearing a turban and carrying a large kirpan, or sword, across his body. We had come prepared with head coverings and we entered through the main area. The marble floor felt cool and soft and it was all so very clean. As we came to the top of the stairs, the Golden Temple almost radiated in the sun. 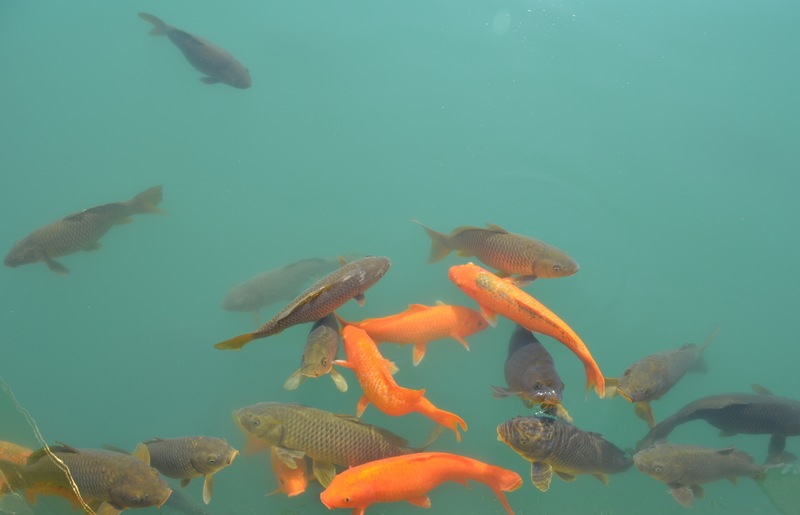 Surrounded by a pool (complete with giant koi) the gold shimmered off of the ripples created by men bathing in the far left corner area. It took my breath away as it had the first time I visited almost 6 years ago. In the center area – a bridge – the people were lined up on to enter into the temple and we joined them. Live music from inside the temple played loudly over speakers that were all over the temple grounds. It took about 1 hour for us to finally reach the inside of the temple and when we entered the entire room was filled with gold filigree – everything from railings, to walls, the ceiling and doorways and in the center sat four musicians and a man making prayers. To the right sat many women, slowly rocking and chanting and many people who entered were giving offerings and making prayers. We exited out the left entrance and walked the perimeter of the building. Outside there were rugs laid out where some people sat crossed legged meditating while others sat on the few benches provided. From inside the immediate temple area, I looked out at people who were walking, taking pictures, bathing, buying chai and snacks. There was a quiet about the temple even through the chanting, the stillness swept over me and I found myself being reflective, tranquil, and rendered silent. We stood observing people and just taking in the sun. A sweet peacefulness, despite of the historical unrest three decades earlier, resonated throughout the temple and I found my heart opening up to this part of India that felt very different from the rest of the places I had recorded in. There was a deep sense of pride, quiet strength and reverent dedication to their religious practice. As we left the temple and began to walk back to retrieve our shoes, I walked along the red carpet and noticed that the stones underneath did not hurt as much as when I had walked in. Was this because the pathway back was less rocky? Or had I “let go” of the rigidity of western attitudes and just experienced what it was like to be a devout Indian – connected to something greater and completely in the present moment of ‘now’. 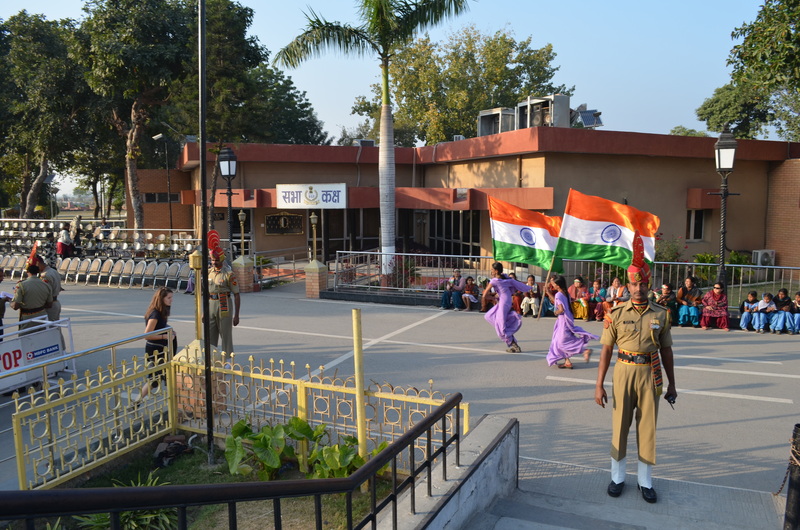 The Wagah border ceremony has become somewhat of a spectacle in the last decade. 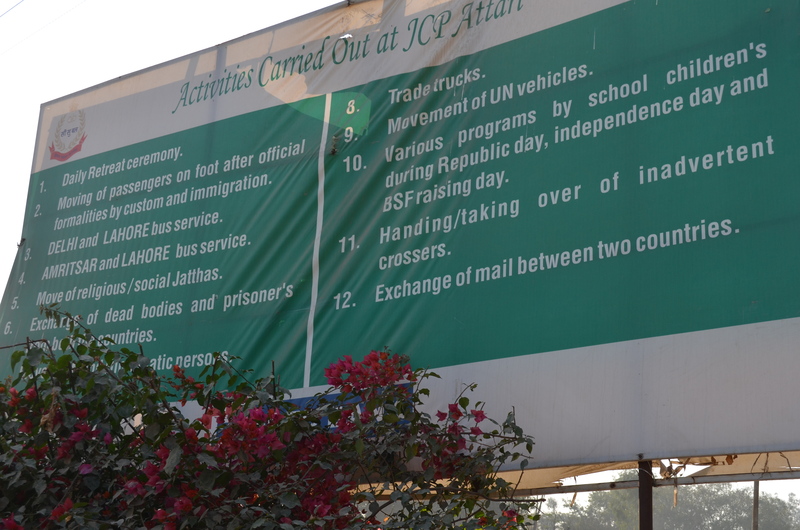 What was once a simple closing of the border and lowering of flags, now draws thousands of people every week on both the Pakistan and Indian border sites. The ceremony takes place on Grand Trunk road which is the only road opening between the two countries until Kashmir up in Northern India. The iron gates between the border are opened at sunrise and closed at sunset. After a brisk, high-kicking ceremony, the gates are opened, the infantrymen on both sides salute one another, lower their respective flags, shake hands and the gates are closed again. This sole border handles any kind of transport between the two countries. This sign outlines its responsibilities perfectly. We drove to the closest point possible for our driver to park – about two kilometers from the border and then began to walk the rest of the way. Kiosks lined the dirt roadside area selling blankets, scarves, handbags, food and drinks. The smell of popcorn wafted through the air as we walked quickly with hundreds of other people. Eventually, men and women were divided and as we parted ways it seemed odd to me that there were hundreds of women and very few men attending. We went through a security gate area that seemed like it wasn’t activated as the female guards just looked at my bag and camera and waved me through. After the security check point, we were rejoined and ushered behind a large steel gate that was lifted for us to enter once we showed our passports. Only tourists were allowed in this designated area and specific seats had been reserved for us forward of the crowd. The guards who seemed almost giant to any other Indians we had seen in other cities in India were dressed in very large head dresses sporting a red fanned feather hat and tan coloured uniforms. It seemed that there were many school kids that had arrived in buses and slowly our designated seating area (stone steps) was filling up. The guards kept telling everyone to sit down blowing whistles and pointing. Then the ceremony began with music playing over the load speakers and people lined up to run to the gates with Indian flags. Most were couples of women both holding the flag and running. Then suddenly the guards would come to salute on either side of the street, yell out orders and then kick their legs very high sometimes almost knocking off their headdresses. Some British tourists, found this quite amusing and began to laugh. The infantrymen would then “storm” in a brisk march towards the gate, arms swinging and crowds cheering. Then he would stop and march in place then salute the flag and senior officer that was there. The day was waning and eventually the gates were opened and although many people struggled to see better, the guards blew their whistles and forced them to sit back down. The soundscape I was able to capture does not show the actual saluting of the guards on both sides as I was unable to get a good view of this. However, we can see the gates open and hear the cheering on both sides. This soundscape is a bit longer than the others as I felt that it was important to capture the many facets of ritual taking place. Enjoy!